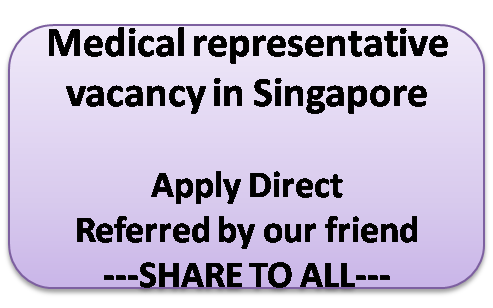 What a great chance waiting for you to work as medical representative in Singapore, the amazing city. One of our highly respectful member of the group, a well known businessman, and a perfect Gentleman, Mr Abdul saleem informed us that there is a vacancy of Medical representative in Singapore. He is very active in providing new dimension to Pharmaceutical care. You can contact him in this facebook id, https://www.facebook.com/abdul.saleem.315213 .